HTC One X10 Press Renders Surface; Unveiling Soon? - Playfuldroid! Even before the announcement of HTC U Ultra and HTC U Play smartphones, the rumor mill had revealed information on the HTC One X10 smartphone. The phone was pegged to launch on January 12. However, it did not come true. An alleged official press render of the HTC One X10 smartphone has now been revealed by the popular leakster, Evan Blass. The press renders reads “big style meets bigger battery,” which indicates that the HTC One X10 would be coming with an aesthetically pleasing design and a larger battery. 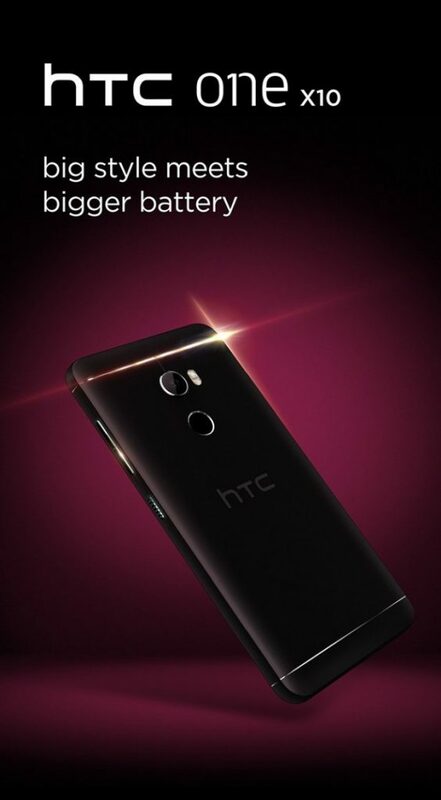 However, neither the press render or the leakster has revealed any information on the exact size of its battery. The HTC One X10 is rumored to arrive as a successor phone for HTC One X9 form last year. It is speculated to come with a 5.5-inch full HD display and it may be driven by MediaTek MT6755 (aka Helio P10) chipset. The SoC is rumored to be accompanied by 3 GB of RAM. For photography, it is rumored to feature 16.3-megapixel rear camera and 7.9-megapixel selfie camera. The press render suggests that a fingerprint scanner will be placed below its rear camera. Xiaomi Mi Max 2 to Launch on April 19 Alongside the Xiaomi Mi 6?